Background: Laparoscopic sleeve gastrectomy (LSG) is gaining popularity as a primary or revisional bariatric procedure with outcomes similar to the more commonly performed gastric band and gastric bypass. Staple line disruption and leakage after LSG is a significant source of morbidity and mortality. Surgeon practice with respect to staple line reinforcement varies considerably. The aim of this study is to retrospectively evaluate the effect of staple-line reinforcement on the gastric leak rate, overall morbidity, and mortality. 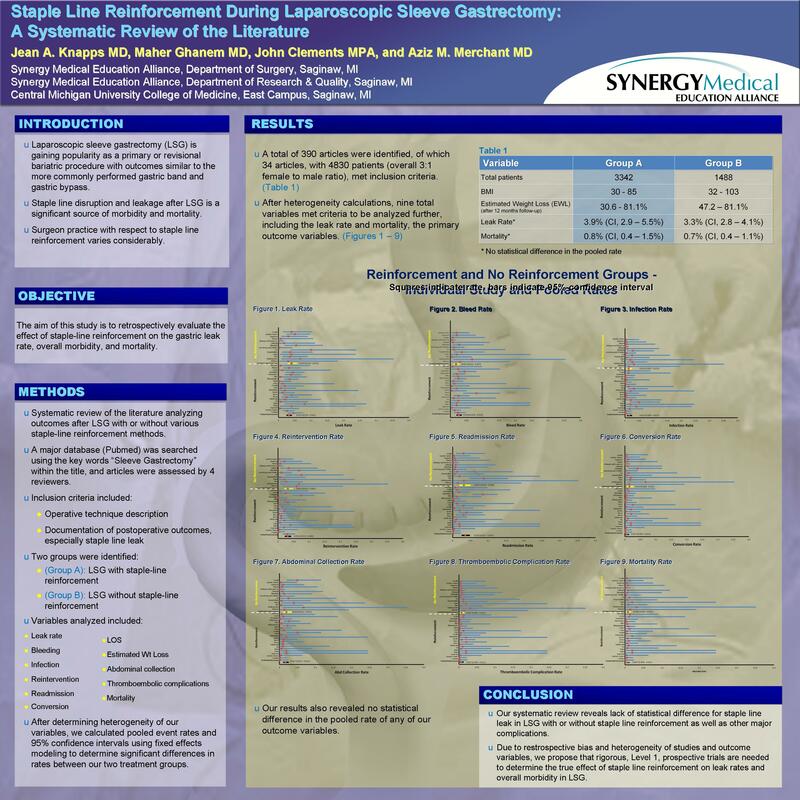 Methods: We conducted a systematic review of the literature analyzing outcomes after LSG with or without various staple-line reinforcement methods. A major database (Pubmed) was searched using the key words “Sleeve Gastrectomy” within the title, and articles were assessed by 4 reviewers. Inclusion criteria included operative technique description, and documentation of postoperative outcomes, especially staple line leak. Two groups were identified: LSG with staple-line reinforcement (Group A) and LSG without staple-line reinforcement (Group B). After determining heterogeneity of our variables, we calculated pooled event rates and 95% confidence intervals using fixed effects modeling to determine significant differences in rates between our two treatment groups. Variables analyzed included leak rate, bleeding, surgical site infection, reintervention, readmission, and mortality. Results: A total of three-hundred and ninety articles were identified, of which 34 articles, with 4830 patients, met inclusion criteria. Group A had 3342 patients and Group B had 1488 patients, with an overal 3:1 female to male ratio. The BMI ranged from 30 to 85 for group A and 32 to 103 for group B. The ranges for estimated weight loss (EWL) after 12 months follow up were 30.6% to 81.1% for group A and 47.2% to 81.1% in group B. After heterogeneity calculations, nine total variables met criteria to be analyzed further, including the leak rate and mortality. The leak rate was 3.9% (CI, 2.9% to 5.5%) in group A and 3.2% (CI, 2.8% to 4.1%) in group B, indicating a lack of statistical difference in the pooled rate. In addition, mortality was 0.8% (CI, 0.4% to 1.5%) in group A and 0.7% (CI, 0.4% to 1.1%) in Group B, again indicating a lack of statistical difference in the pooled rate. Our results also revealed no statistical difference in the pooled rate of any of our other seven outcome variables. Conclusion: Our systematic review reveals lack of statistical difference for staple line leak in LSG with or without staple line reinforcement as well as other major complications. Due to restrospective bias and heterogeneity of studies and outcome variables, we also propose that strong, Level 1, prospective trials are needed to determine the true effect of staple line reinforcement on leak rates and overall morbidity in LSG.